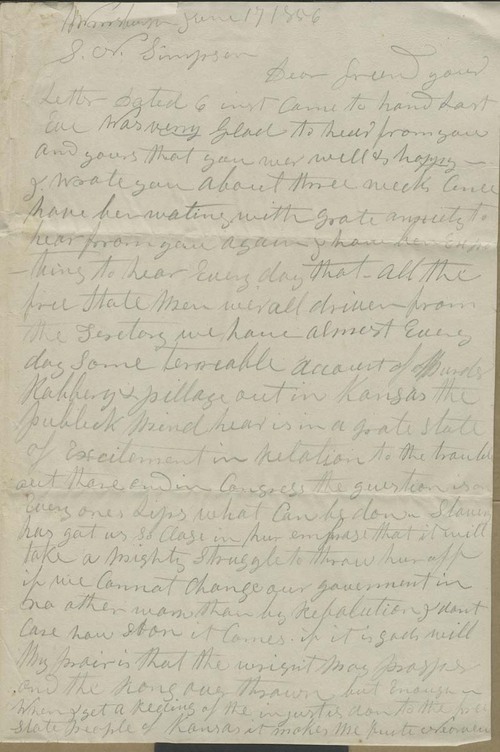 Hiram Hill wrote from Williamsburgh, Massachusetts to Samuel Simpson in Kansas Territory, responding to the news of recent violence there. Hill reported that the public was excited over the Kansas troubles and the Kansas question in Congress. Hill demonstrated his resolve in supporting the free state cause, stating that "Slavery has got us so close in her embrase [sic] that it will take a mighty struggle to throw her off if we cannot change our government in no other way than by Revolution I don't care how soon it comes". He also responded to Simpson's reports regarding the construction of his home in KT, trouble with delinquent tenants, and the market for land sales.